In R, we can transpose our data very easily. In R, there are many packages such as tidyr and reshape2 that helps to make it easy. In this article, i would use 'reshape2' package. This package was written by the most popular R expert Hadley Wickham. The code below would create a sample data that would be used for demonstration. dcast function returns a data frame as output. acast function returns a vector, matrix or array as output. The left hand side of the casting function refers to ID variables. The value.var would contain a name of the variable that stores values. Let's see another example wherein we have more than 1 ID variable. It contains information about Income generated from 2 products - Product A and B reported semi-annually. In the above code, "Year + SemiYear" are the 2 ID variables. 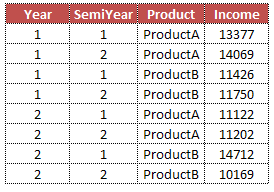 We want "Product" variable to be moved to columns. The income values are incorrect in the above table. We need to define the statistics to aggregate income at year level. Let's sum the income to report annual score. Suppose you have data containing information of species and their sepal length. The data of sepal length of species are in columns. The following program would reshape data from wide to long format. id.vars - ID variables to keep in the final output. 1 Response to "Transpose Data in R"
Thanks for sharing such a wonderful article on Transposing data. However, I still have some doubt associated with, if I will compare it with SAS. The variable which you are saying that its an "ID" variable, by sas I can say that it a "BY" variable because that's something which we are keeping it on the left hand side and rest we are "ID" by sas. please reply to clear my small dubiousness.